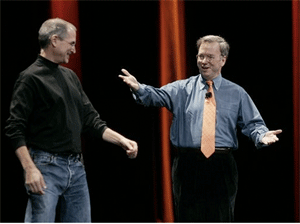 Google CEO Eric Schmidt Resigns From Apple Board. Surprised? Lots of people will be arguing today that this was inevitable, but the news comes faster than expected. Google CEO Eric Schmidt is no longer going to sit on Apple’s Board of Directors, nearly 3 years after accepting a seat. The resignation comes a few days after the FCC sent letters to Google, Apple and AT&T inquiring why Apple denied the Google Voice application from its iPhone App Store. Hardly surprising, and it’s good to see both come clean on the situation: you can argue all you like, but Google’s foray into the mobile and computer operating systems, the two products mentioned in the statement (not to mention Chrome in the browser space), must have been quite the thorn in Apple’s and Jobs’ side. And I’m quite certain that the whole Google Voice App / FCC debacle only made the process a bit speedier. Many people have always found it strange that Schmidt was on Apple’s board, but back in August 2006 when he took the seat Google had virtually nothing even remotely competing with Apple’s core products and services. It’s only in the last 20 months or so that possible conflicts of interests really became an issue, and we can’t forget that Schmidt was consequently asked to leave board meetings when critical things were shared about Cupertino’s plans for the iPhone and the App Store.